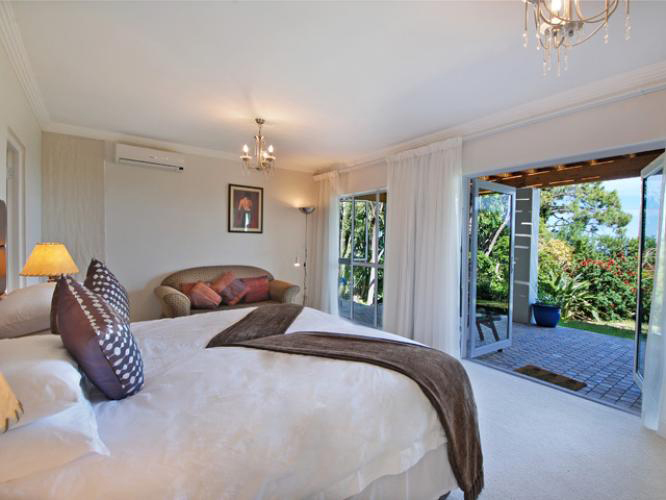 Shala Gashle – meaning “Stay in Peace” – is a magnificent 5 bedroomed Villa on the slopes of Table Mountain above famous Camps Bay, and is simply one of the best kept secrets for holiday bliss. Solid wood front doors open up into a cozy foyer, revealing elements of Africa mixed with Contemporary Styling..
Just off the entrance a large dining room table makes for comfortable entertaining. Positioned on a split level below the dining area, the living room generates a sense of calm and peace. 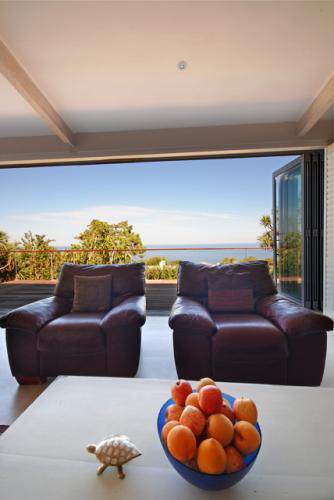 Large Burgandy coloured leather couches and light wood floors frame this space as one for comfortable relaxation. 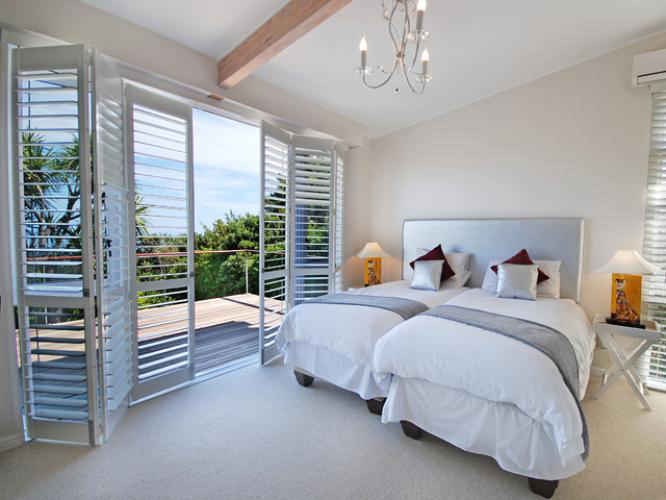 Concertina-styled American shutters fold away to reveal panoramic, uninterrupted Sea Views. 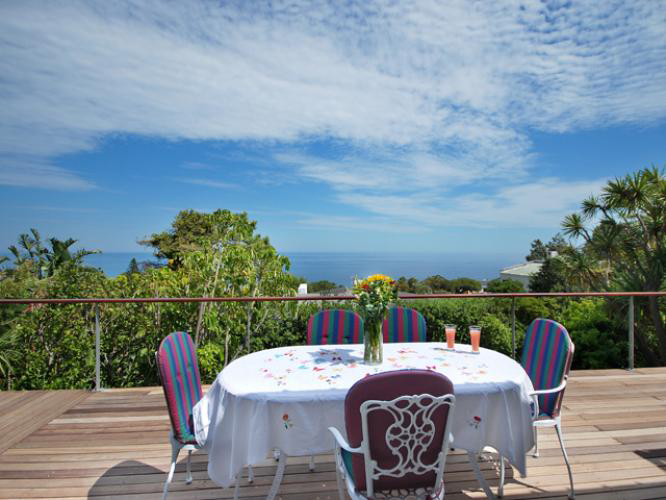 Leading directly off the living room, the wooden deck offers yet another setting to enjoy peaceful encounters with the sea and mountain views famous in Camps Bay. Revel in the comfort of any one of the 5 large bedrooms, each boasting flair and elegance accentuated by stylish finishings. 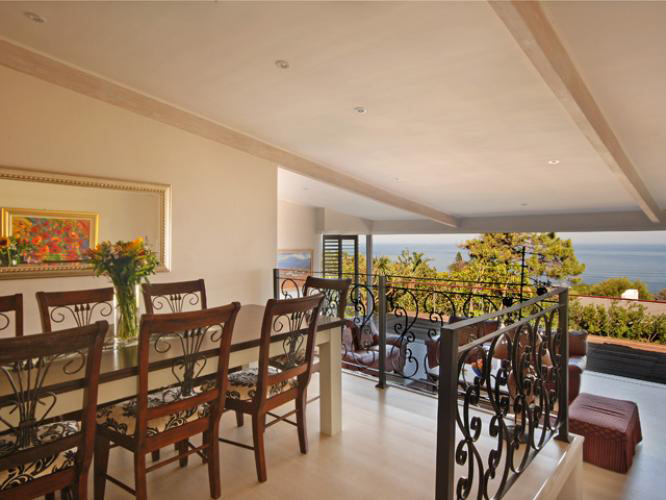 The first two bedrooms are positioned on the dining room level, enjoying partial sea views. 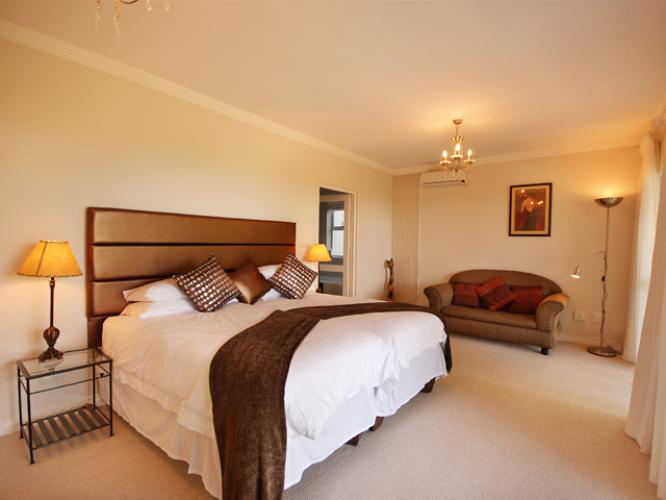 The third bedroom off the living room opens up onto the balcony, enjoying magnificent Sea Views. 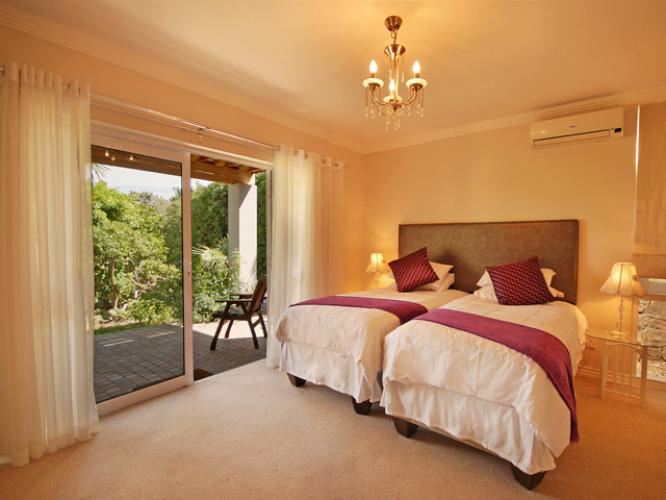 The Fourth and Fifth rooms are on the lower level, enjoying direct access to the lavish greens of the garden and swimming pool area. Contemporary headboards frame each of the king size beds, conveniently made up of two large single beds. 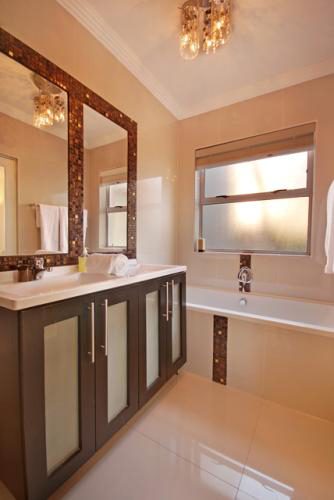 Each room is unique in style – colour themes are accentuated and complimented by luxurious tiles in the bathrooms. 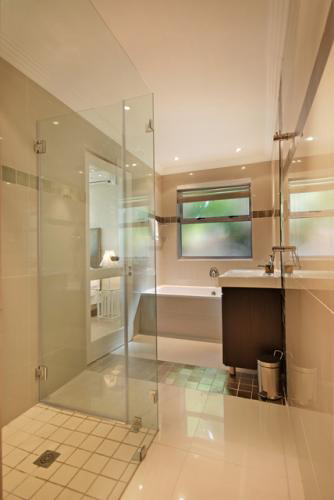 Large showers, ample storage, underfloor heating for colder winter nights, and beautiful fittings give these bathrooms a glamorous effect. All rooms enjoy the convenience of a bar fridge neatly tucked away for hot summer night refreshments. Air-conditioners, doubling up as heaters, provide the finishing touch to ensure just the right ambient temperature for the discerning guest. 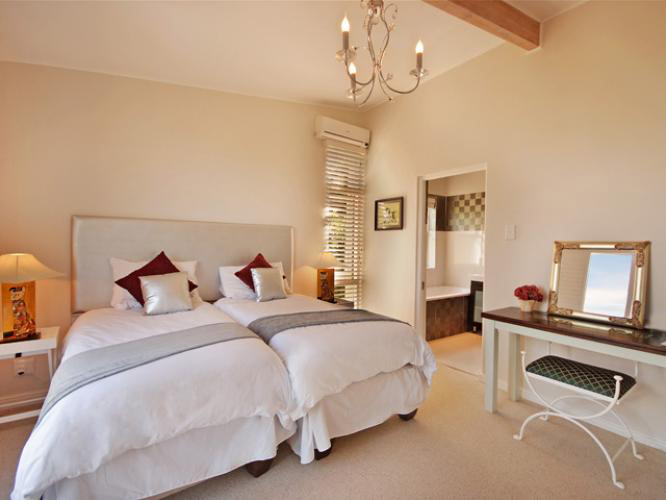 Finally, each room is furnished with a flat screen TV, offering an individual DSTV Hotel bouquet. Set just behind the Dining area, the private kitchen is of a comfortable size. Gas plates with electric cooker and modern kitchen equipment make for easy meal preparation. 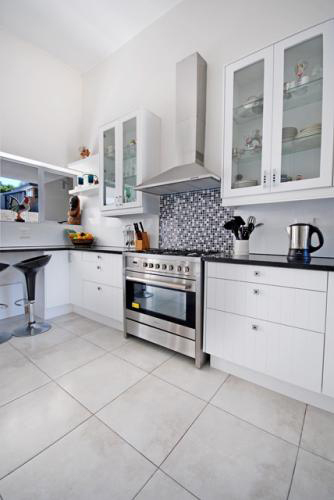 On a completely separate level, a few stairs above the main cooking area, the Kitchen expands to a Scullery, equipped with Dishwasher, Washing Machine and Tumble Dryer. 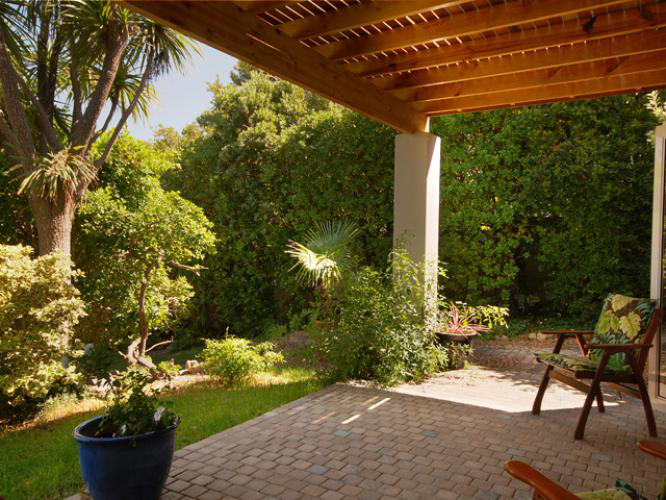 The Garden is on the lower level of the house – accessed by both of the downstairs bedrooms or via stairs leading directly off the wooden deck from the living room. The spacious garden opens out onto a large swimming pool, perfect for relaxing Summer days on comfortable Sun-loungers. 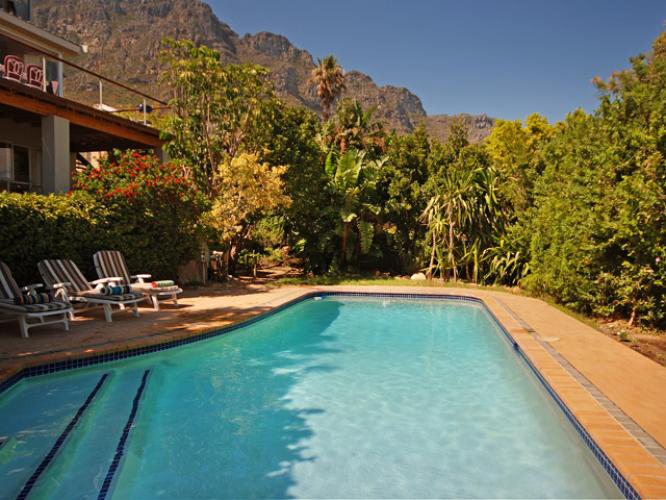 Just a short walk leads to the “ Pipe Track “, a breathtakingly beautiful walk along the side of Table Mountain, whilst a five minute drive takes one into the centre of the city or to Camps Bay’s famous world class beach front. There is ample off street parking and a quick response security system for peace of mind. 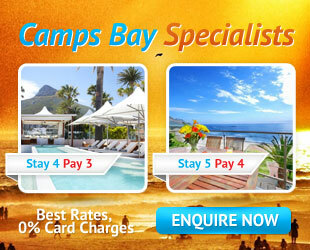 This is a place to truly relax and be at one with the magical views and breathtaking sunsets of precious Cape Town. If travelling in style and comfort is paramount to your journey, then Shala Gashle is one to consider. Staying true to it’s title, at Shala Gashle you really will stay in peace! Please note that Shala Gashle is a dual residence, and the top level of the property is a separate residence with its own private entrance. It has no impact in terms of privacy or noise.